Business cards are an important item for all businesses whether it is for a small enterprise or a big corporation. They are given to potential customers and business partners to showcase a company’s products and services. The sad thing is, many are dumped a few hours after they were given. Therefore, if you want your business card to remain in wallets and not in the bin, you need to have a well-designed and creative business card which will make people stop and think about your business. 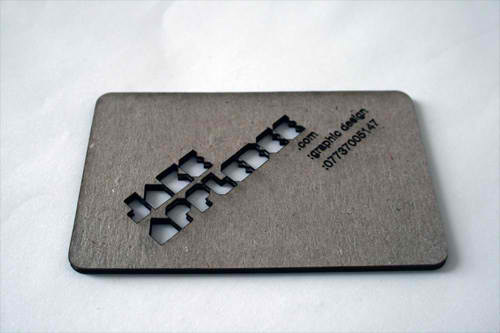 Laser cut business cards are generally eye-catching even when having simple designs. Business card of this type make use of a laser cutter to cut very complex shapes and designs with near perfect edges. Here are the 30 Impressive Laser Cut Business Cards for your Inspiration. Check out this collection for a few minutes before you begin designing your own business card so that you will get some amazing concepts on how to make your business card stand out to your customers. Take a look and be inspired by these visually interesting and creative designs. Have a great time browsing! Which among the laser cut business card designs in this collection was able to catch your attention? We would like to hear your responses in the comment section below. This an incredible designs..Good idea for the main designer. I like the robotic style of Thomas Christensen,it’s a remarkable card. Creativity is shown in this post,great works. “Magical Laser Cut Cards” is an elegant style card. I peek for TRIBE,it’s a cool design. It’s my pleasure to use your idea in making a creative business cards. I like the design but my only concern is that, I want that card to still contain the important info about my business. Having a nice card for our business is 1 of the best way to attract customers so thanks for the ideas.